Recently I was asked my view on how to set prices. The issue came up after I spoke at a national trade association conference to a room full of business owners. The discussion was robust, and as you can imagine, everyone had an opinion. Below is a summary of what I shared with these business owners as to my six ways to determine price. My preference is #5. 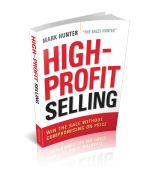 This is the one that works the best when the salesperson has the ability to demonstrate value, which is the key role of what sales is charged with doing. Since it was such a worthwhile discussion with the group of business owners, I felt you too could benefit from it. This brings me to a key point — if your company or your association is having a meeting, give me a call and I will come speak to your group. Together we’ll help make it your best meeting ever.